Are You a Professional Lineman? Today we are going to talk about the types of lineman, in my mind there are two types, professional Lineman and regular Lineman. 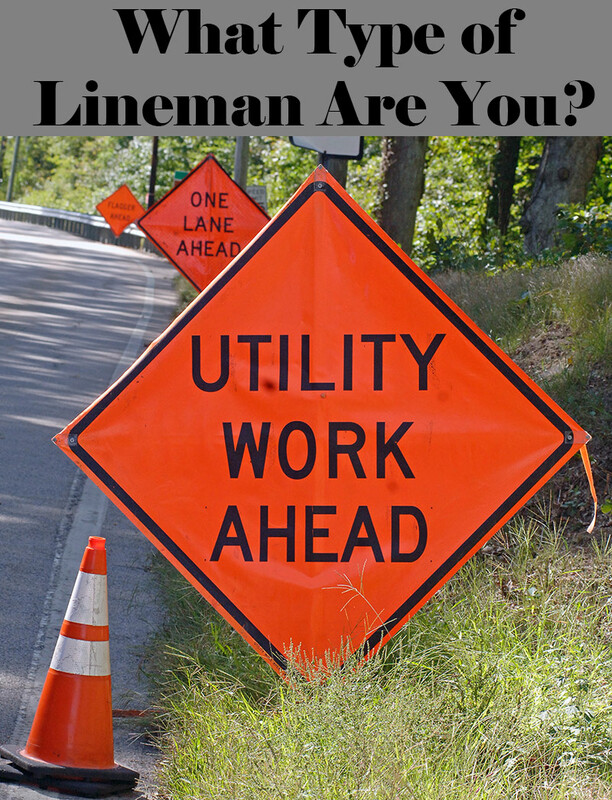 If I were to ask you, “are you are a professional lineman,” how would you answer? I am pretty sure you would answer yes, but are all Lineman really professionals? Many Lineman need to up their game, there have been a few times in my career when I needed to up my game and improve my professionalism. During this time I learned a few things from other people about how to improve, let me share them with you. The definition of a professional is “person prepared for work or extended study.” I think the key word is the definition is prepared, are you always prepared when you are on the job? A professional is always prepared no matter how routine, always takes the time to do things right, always helps others to be safe on the job. Not every lineman is a professional, sometimes you get into the same old routine as a lineman, you don’t always take preparation seriously, you don’t do a proper tailboard, don’t cover properly while doing hot work, make excuses why you don’t need your PPE. I was talking to a friend of mine, I was telling him that I had been to a safety conference and I heard a presentation where someone was talking about how we shouldn’t be so picky when we do a crew inspection, small things like wheel chocks, doing a detailed tailboard and not using safety glasses every now and then was no big deal, we should focus on the big things that cause injuries and accidents, not the details. My friend looked at me and said, “David, the small things are always symptoms of the big things.” It took a second for that statement to sink in. He continued, “take a look at the training routine of Floyd Mayweather. He pays attention to the details and is the consummate professional, and he has the results to prove it.” I thought about his statement all the way home, as soon as I got to a computer I Googled Mayweather and his training routine. I was surprised how closely he pays attention to the details. If Floyd Mayweather was on the crew with you, what do you think he would do? Do you think he would blow off the tailboard, breeze through the truck inspections, “forget” to put on his hardhat and safety glasses. I’m pretty sure if he was a lineman, apprentice or helper he would focus on the details every day. Professional Lineman, just like Floyd Mayweather they look after the small details like, proper pre job briefings, make sure everyone has their proper PPE, cover up properly when doing hot work. Make sure the trucks are checked out properly every day, always ground properly. Then there are the regular Lineman, those who think it’s OK to take shortcuts. “The GF is not around, let’s just go ahead and do it, there is no one watching.” “I know how to back, I don’t need a flagman.” They watch others break safety rules and never say a thing. If there is a gray area they use it to circumvent the rules just because they can. “Well that’s not in the safety manual,” I thought we could do that. How many of you fly? I am sure you have seen the pilot walking around the outside of the plane checking certain things, he checks the landing wheels, he looks at the wings. He comes back to the cockpit and he has a checklist than he goes over and checks off the items on his list. It might take 30 minutes to check everything. The pilot does this every single time he takes off. So let me ask you would you want to get on a plane if you knew the pilot never checked out the plane before takeoff? I will be you answered no, so why would you go to work on a job and never do a tailboard, never check out your trucks properly, not make sure everyone knows their role and the hazards of the job you are working on. The Professional leaves nothing to chance. If you are looking to up your professionalism I have a simple way to get started. It doesn’t happen overnight, it is a slow process. By trying to improve on a day by day basis you can get there. The other good thing about taking it slow is, your buddies won’t be ragging on you about how you are making big changes. “What’s he trying this week? “So all of a sudden you are Mr. Safety?” Small changes on a daily basis lead to sustainable change in the long run and that is what you want. I live in Hawaii, I am also a big fan of Marcus Mariota. Marcus Mariota is the starting QB for the Tennessee Titans in the NFL. He was raised in Hawaii and played for the University of Oregon. I was reading an article about him, he was just leaving Oregon and breaking into the NFL. Here is what he said. “Win the day,” that is a great mantra for what we can do as lineman. Here’s how you can win the day, just pick one small thing each day and focus on doing it 100%. If today is the pre job briefing, get everyone together, tell them their roles, have them repeat back how they intend to accomplish their task. Make sure you write down the hazards, don’t just blow through the checklist and write down the same BS hazards like “hot lines, wear all PPE.” Make it mean something, because it does! Be a professional, pay attention to the details and write it down on the pre-job. The next day you start from scratch and try to “win the day.”, pick something new, maybe proper PPE usage. Make sure you wear your PPE like you know you should, Professionals go for the “above and beyond” instead of the, “I have to.” Help other lineman to do the same. I used to have two different foreman, one would yell out, “get your hardhat on Spooner”, the other would say, “Spooner, you need your hardhat on, where is it, I will go get it for you.” Which foreman do you think had more impact on me. The next day, make sure you continue with what you did the first two days. If you get busy and can’t add something this day, it’s OK. Just keep moving forward. The road to being more professional has some curves, it’s not always a straightaway. This is how you “win the day.” It is not about making big changes overnight, which will never work. It is about doing the small things, focusing on the details every day. Try to do your best on a daily basis, don’t worry about the performance tomorrow, only the performance and safety for the day. If you want to improve your professionalism, you only have to worry about improving for the day. The next thing you know you are more of a professional lineman. Whether it’s boxing, football, flying or Linework, there are professionals in every field. But if you are a lineman your profession is more important than Marcus Mariota or Floyd Mayweather, because if you aren’t professional in your job someone can get hurt or die, boxers and football players get hurt but the usually don’t die. You win by making sure everyone goes home at the end of the day to their families. You don’t have to be just a “regular lineman”, things don’t happen overnight but you have to start somewhere. So if I were to ask you, are you a professional Lineman?